What a wonderful recipe! It’s finally chilly in Texas and this cake will taste and smell so good this afternoon. I happen to have ALL those ingredients on hand! Oh, my. Who ever thought of using cake mix as a streusel? This recipe is the reverse of how I've always used it. Can't wait to try. Where does the milk come into play? Does it go with the pumpkin/sugar/spice mixture? Riley, sorry for the omission. The milk has been added to step one. 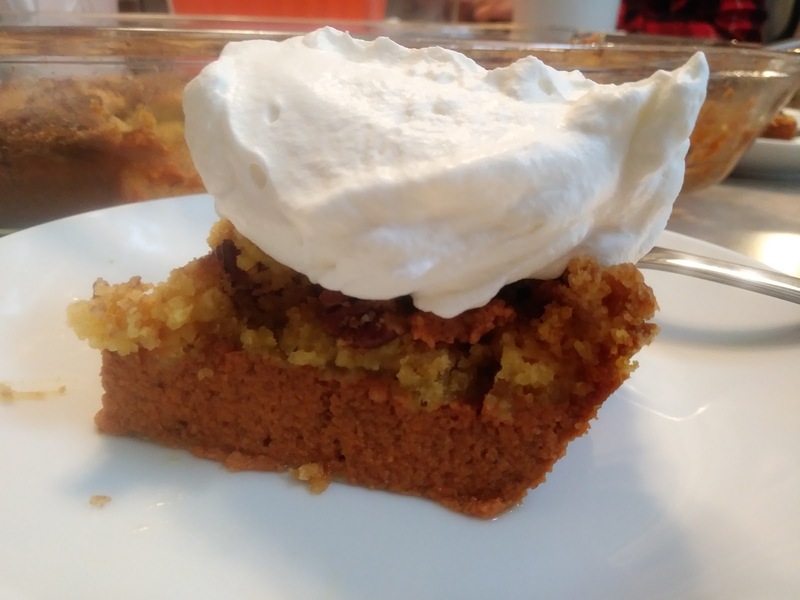 We made a very similar recipe for Thanksgiving; because of allergies we used canned coconut milk in place of the evaporated milk, and a glutin free cake mix. This is the dessert that people came back to for second helpings, even though there were other desserts on the table. We topped it with whipped coconut creme. Nice recipe...but next time I am going to add 1 teaspoon salt to the pumpkin filling. It was just a bit flat.